Daryl Johnson (Worcester Park, United Kingdom) on 12 February 2009 in Documentary & Street. wow, that colour really pops out! @Lorraine: Thanks Lorraine! It's a very public place to be honest! Nice shot. I guess this is a stand up noodle shop. @Steve Rice: Thanks Steve. 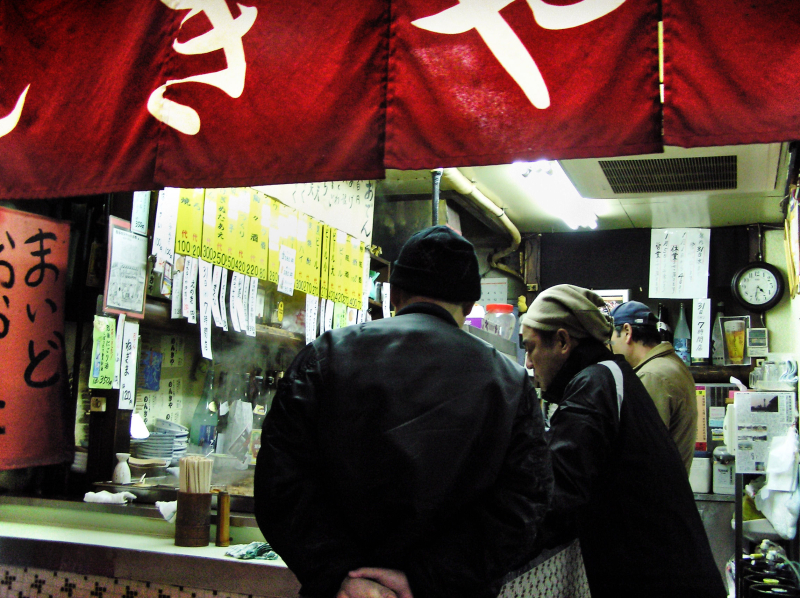 It's an izakaya, selling all sorts of food and drink. looks like cold weather over there with everyone of them wearing a beanie. @David: Yep, it's cold, and the restaurant is basically open to the street (although there is always a heater inside)! A very neat use of compositional elements and colour. Looks a busy place..... do they have Organic Vegetarian springrolls....? @Observing: Err... no... Deep-fried breaded sausage take your fancy Mike? Great capture of this typical "café" Daryl! @standley: Cheers Richard! Not much coffee being drunk here though... do you know shochu? @akarui: Thanks Olivier! Surely you have tachinomiya down in Kagoshima...? culture and tradition put in picture over an instant of life, very well seen.